We sailed east through the night to Española Island, one of the oldest islands in the archipelago. 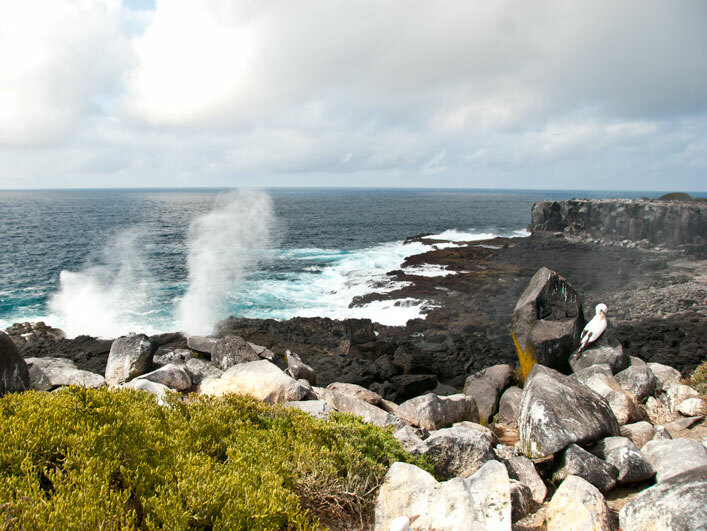 The island is a dormant shield volcano whose cliffs provide ample habitat for some very extraordinary endemic species. 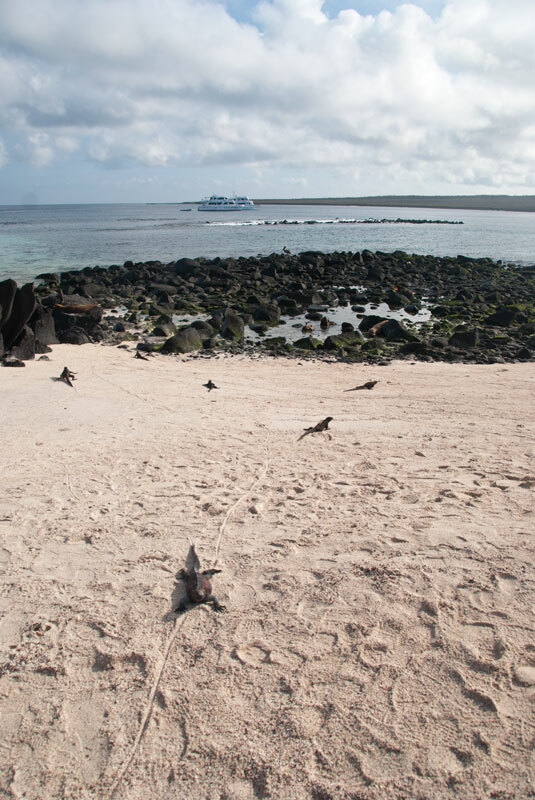 After breakfast we made a dry landing at Punta Suarez. 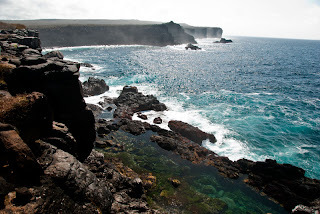 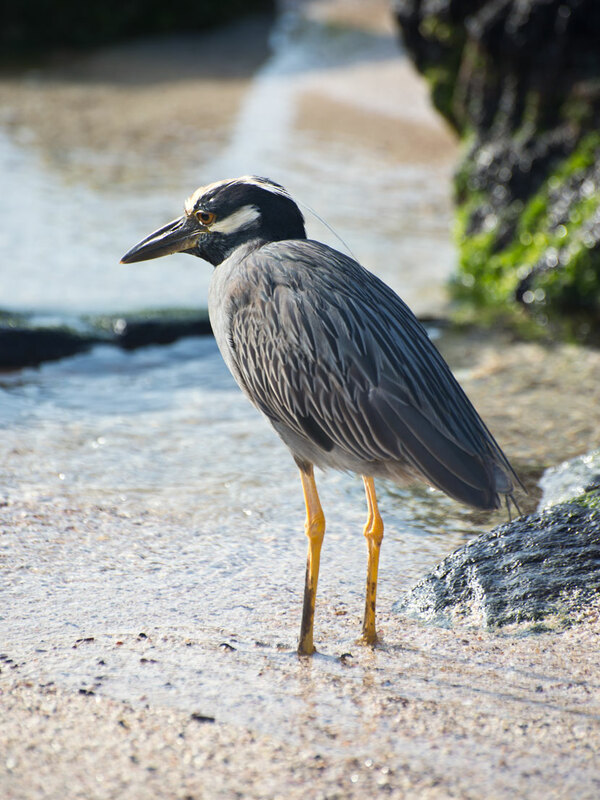 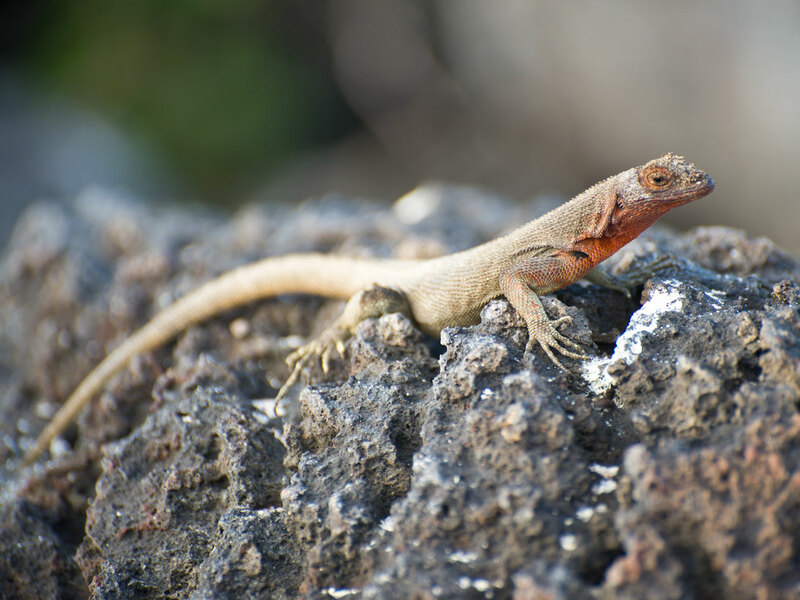 Here you can hike for several hours along beaches and through brush to high cliffs over looking the open ocean, all the while surrounded by hunderds of lizards, iguanas, sea lions, and birds. Many, many marine iguanas. 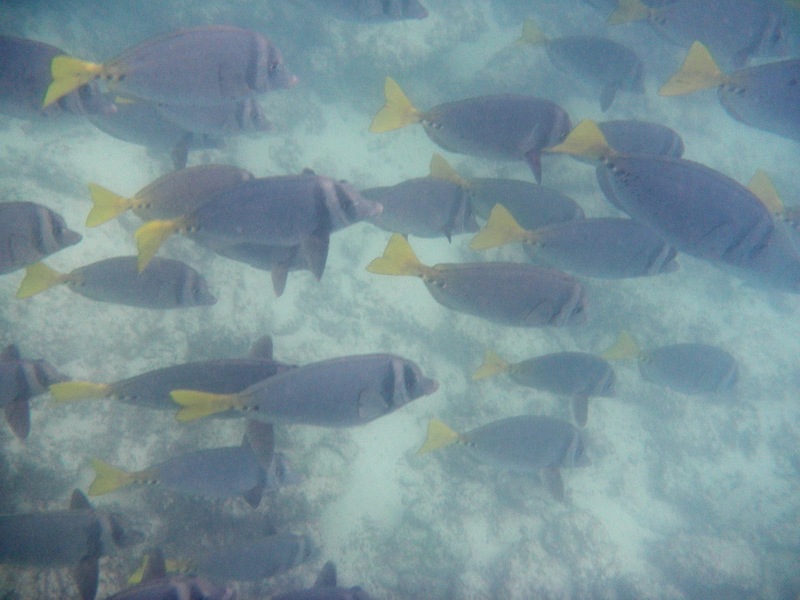 The females are darker in color. 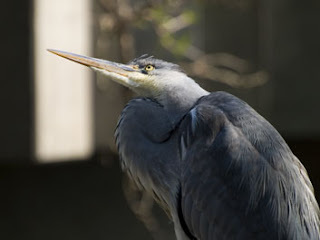 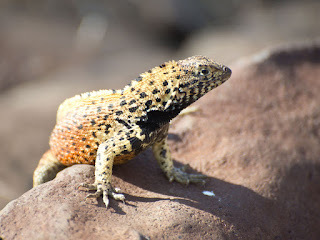 The males are in full breeding colors. 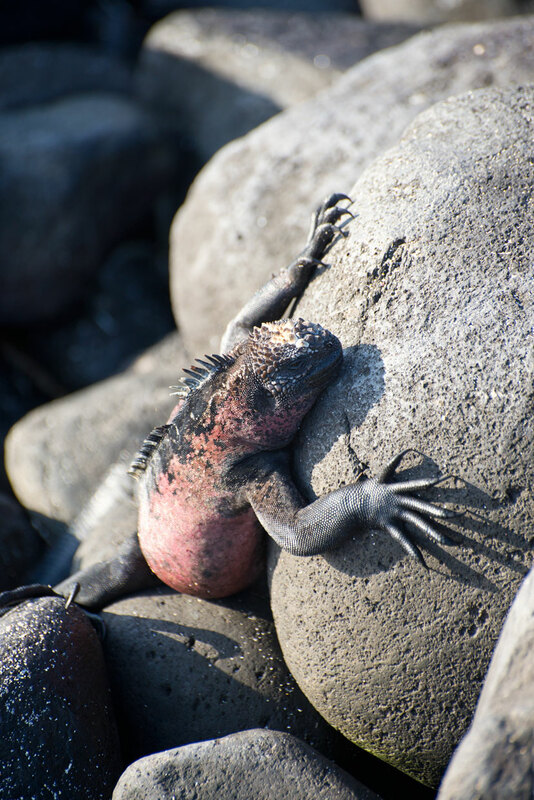 As soon as we arrived we found ourselves on a small sand beach surrounded by black volcanic rocks covered in marine iguanas. 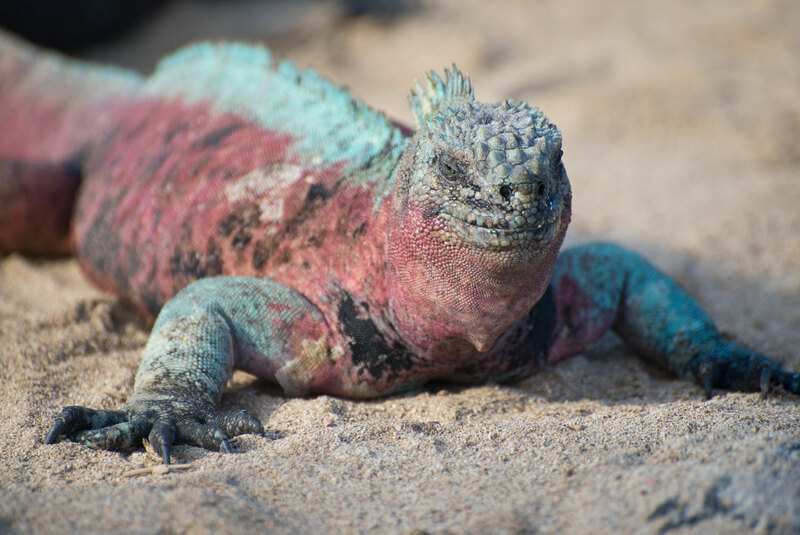 The male marine iguanas here on Española are the only ones in the Galapagos that change color during mating season. 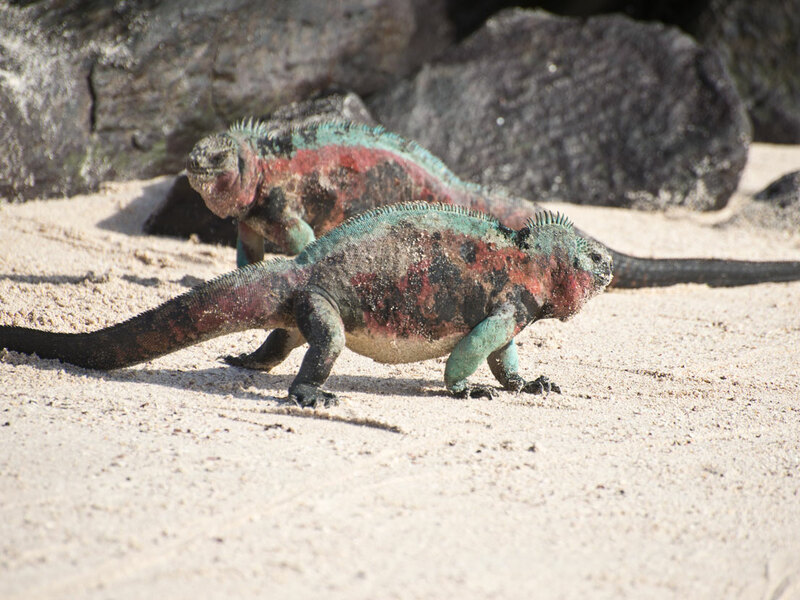 This red and green coloring gives them their alternative name : Christmas Iguanas. 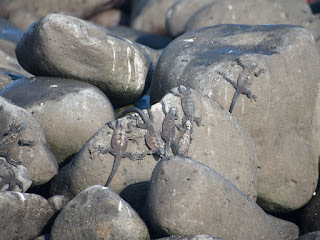 The young are black as the rocks and they clung, in small hordes, to the rocks all around us. 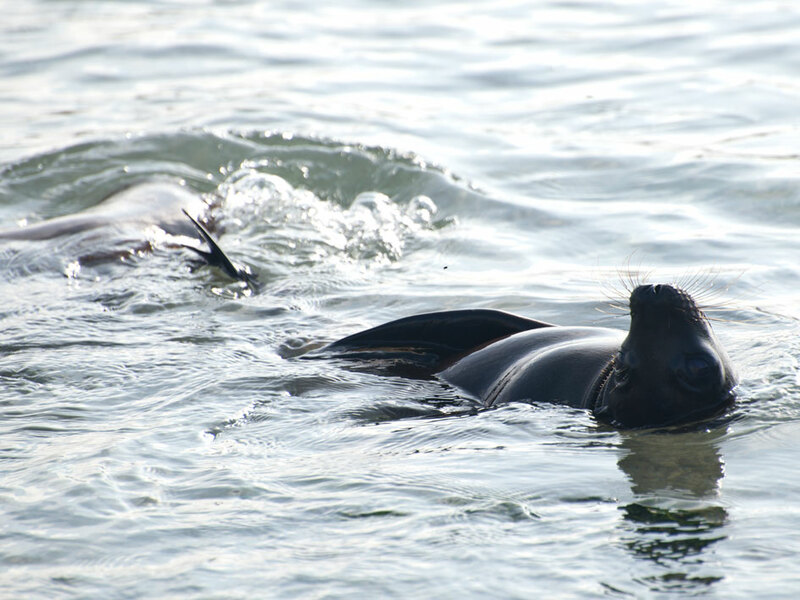 Hundreds of adults basked in the sun before heading out into the water in search of breakfast. 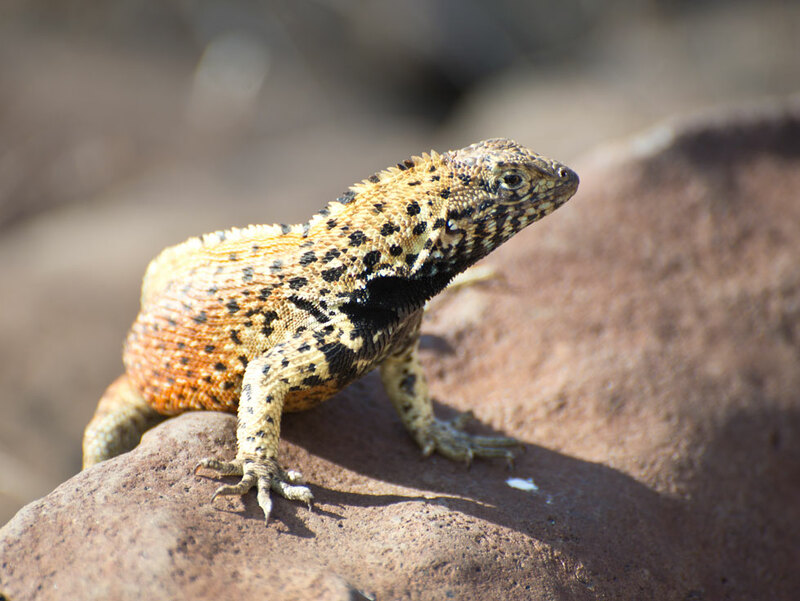 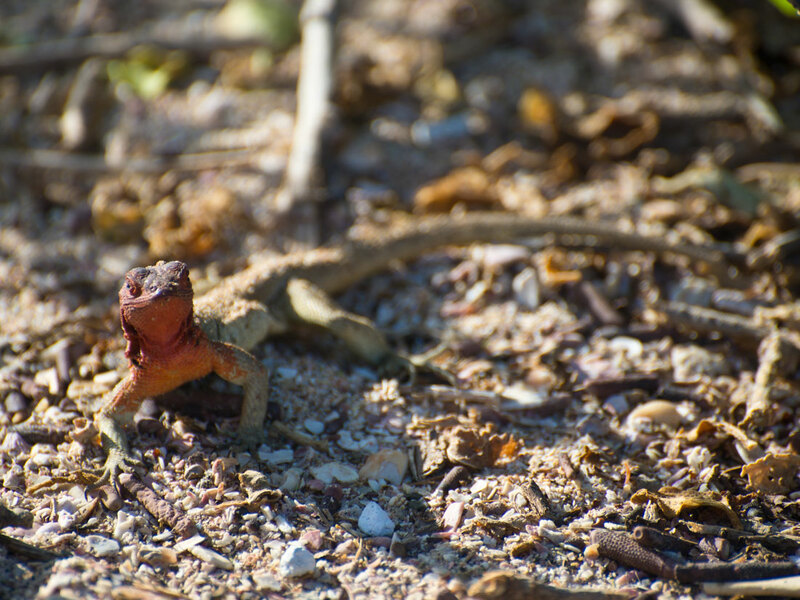 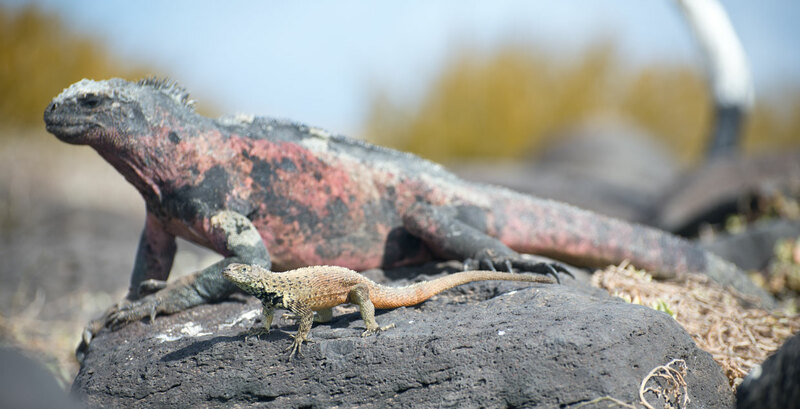 Mixed in with the far larger iguanas were their much smaller terrestrial cousins the Española Lava Lizard. Sea lion "nursery." The Aida Maria, our boat, in the background. 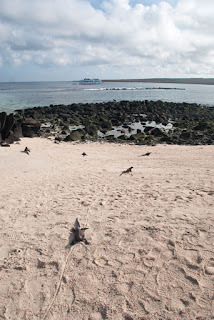 We walked a short way to another small beach covered in marine iguanas and sea lions. 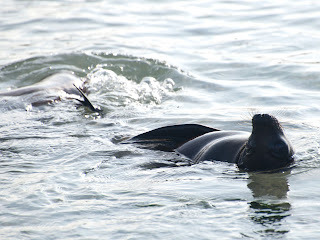 There were sea lions all over the place, including the trail we intended to take, forcing us to take the usual route around the point backwards. 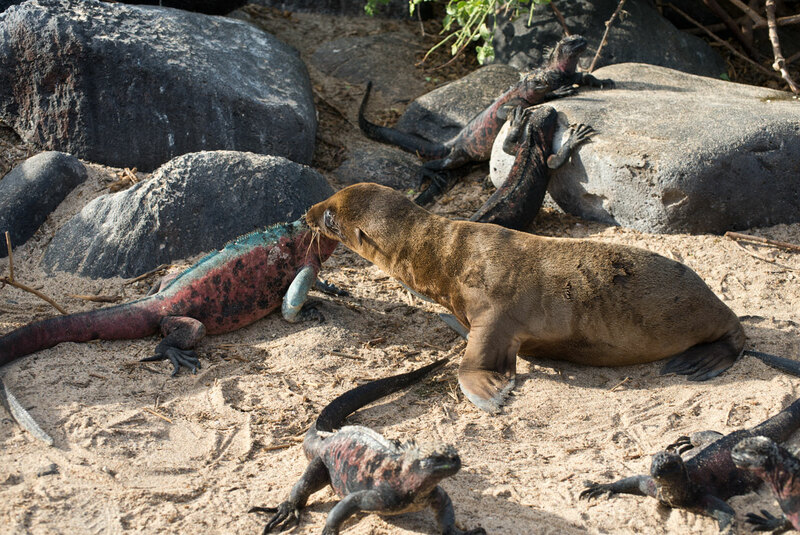 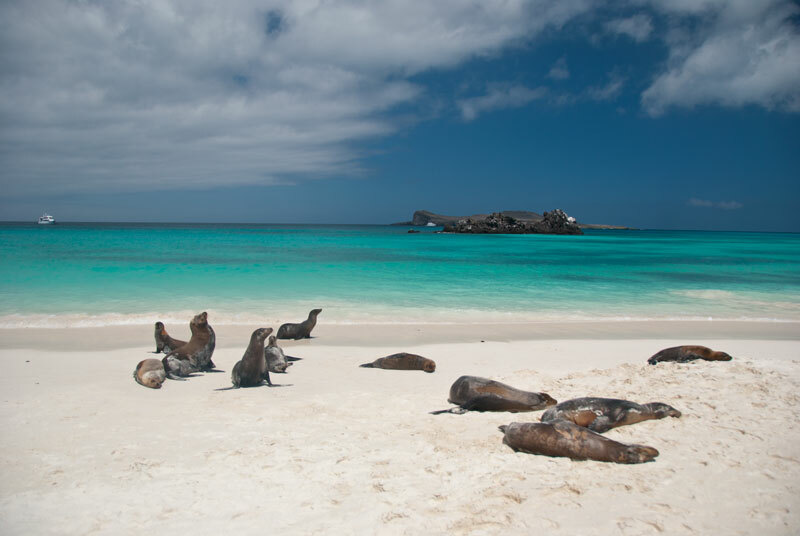 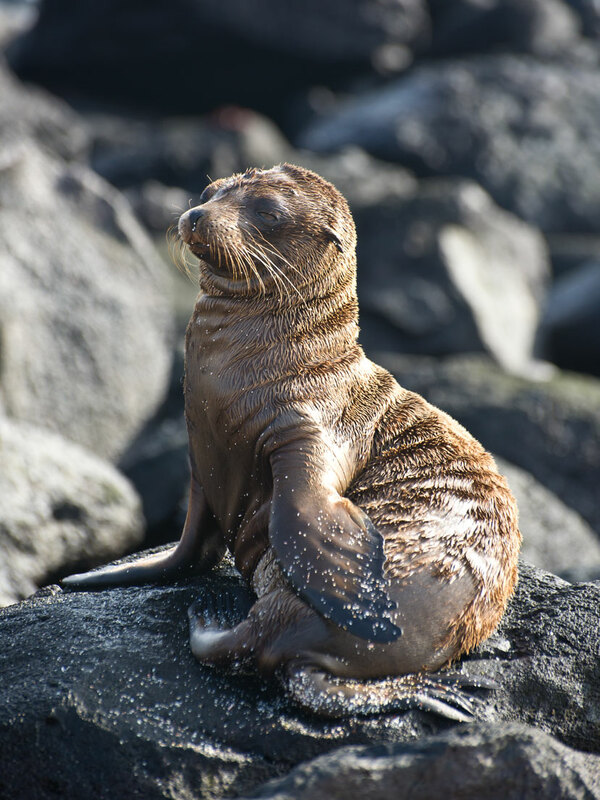 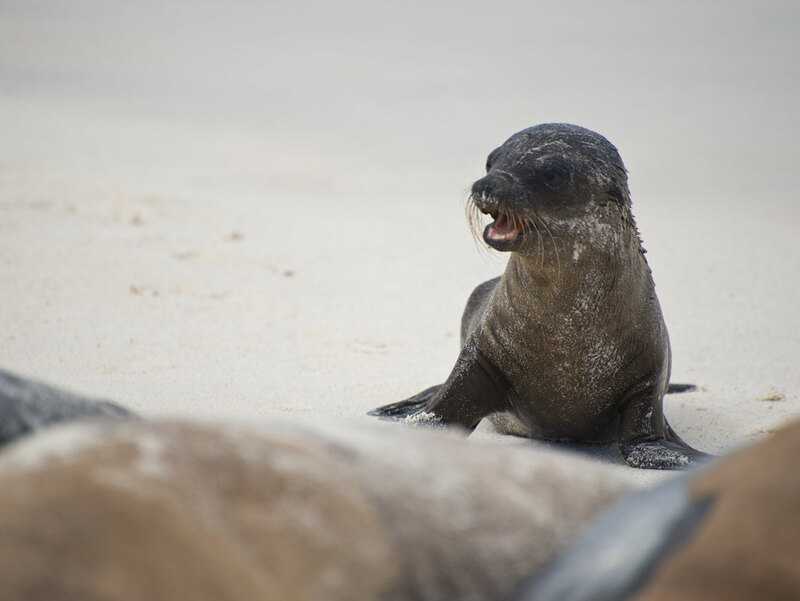 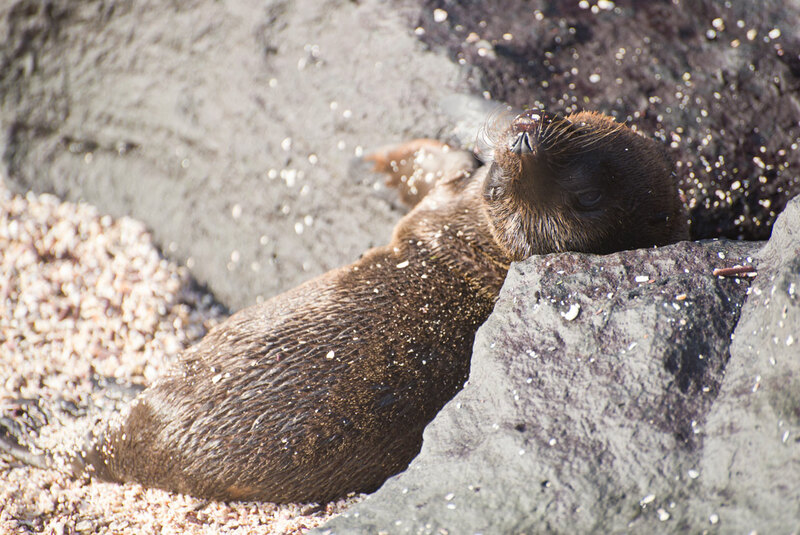 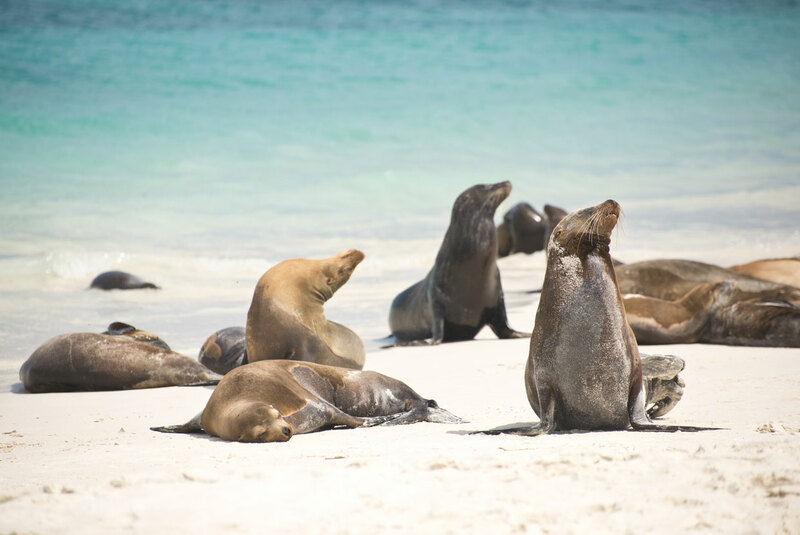 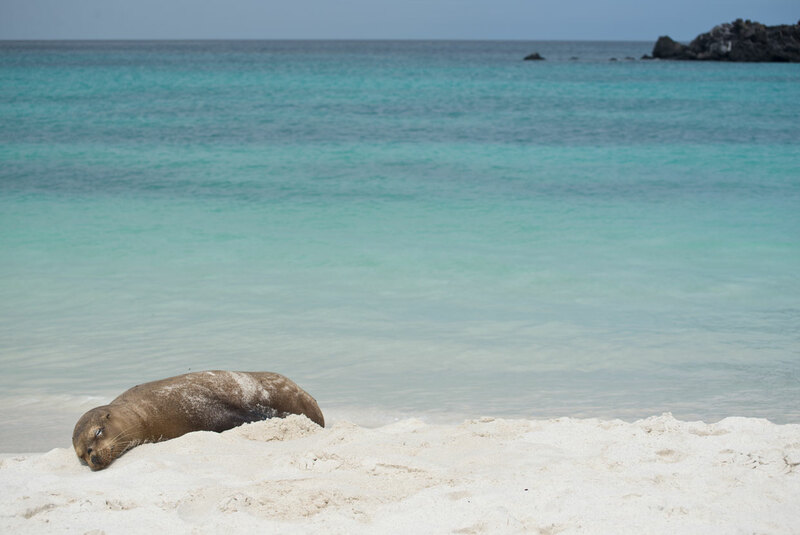 Young sea lions galumphed their way through rows of basking marine iguanas, scattering them, making their way down to the water. Pardon me, excuse me! Sea lion pup on its way down to the water displacing iguanas as it goes. 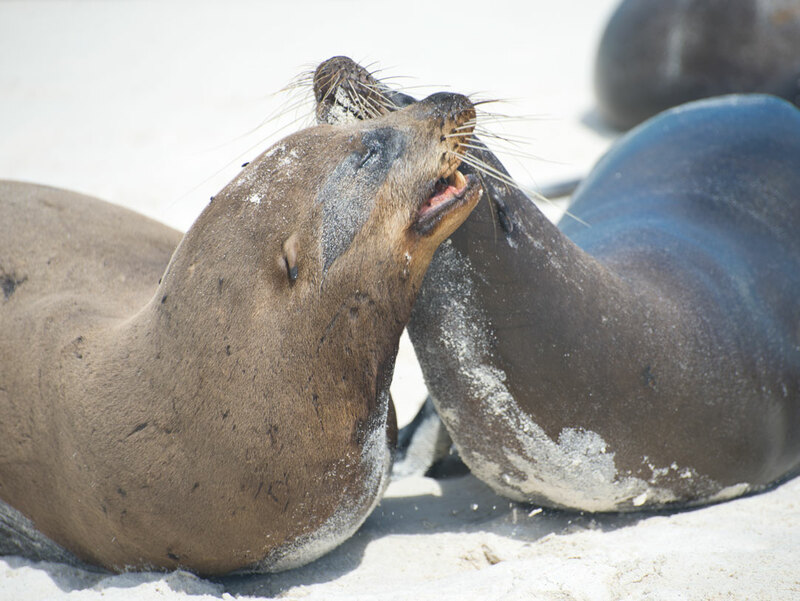 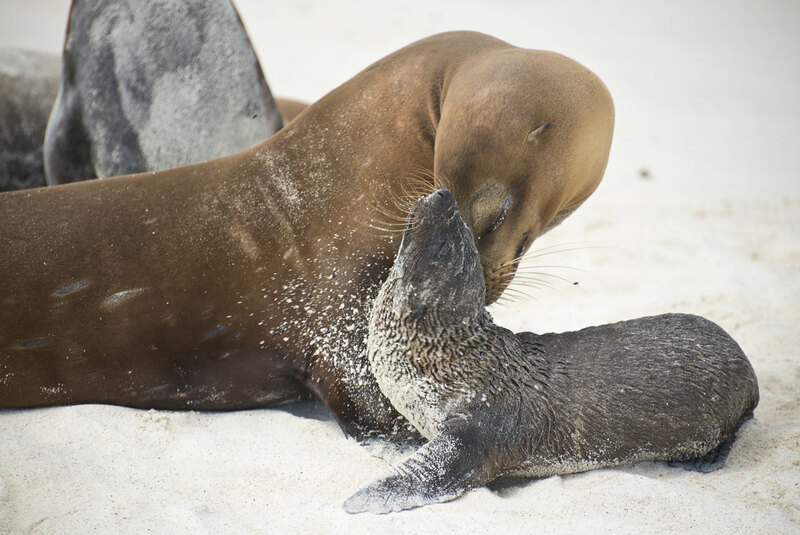 Video of sea lion pups in action. Sea Lion Pup. 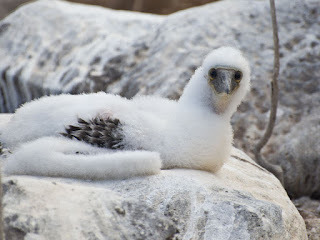 The fur looks a little funky because pups shed their "baby" fur. 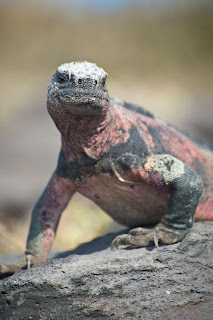 Marine iguana, male. 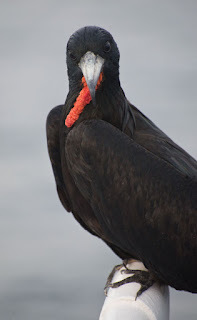 Lurking as only something with claws like that can. Marine iguanas making their way down to the water. A rather beat up male marine iguana. 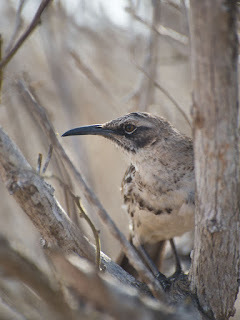 Hood (or Española) Mockingbirds stalked our every move. 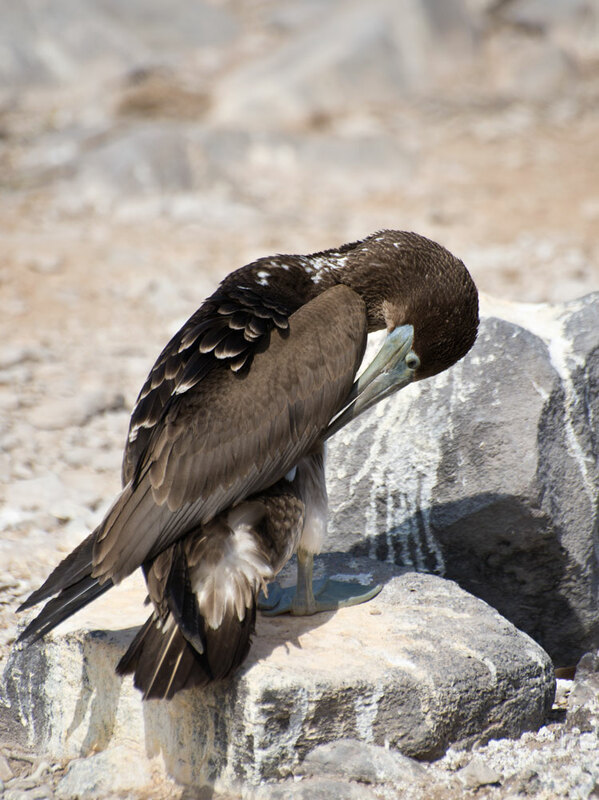 These birds have learned to get water from pecking at humans' water bottles. 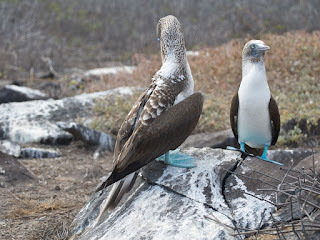 They aren't the least bit shy about doing it either. Two male marine iguanas having a bit of an altercation. 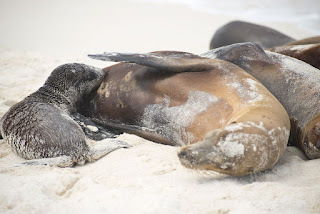 See the action in the video below. 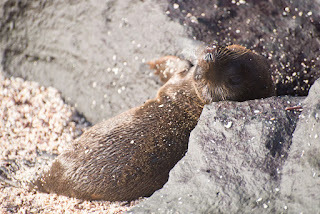 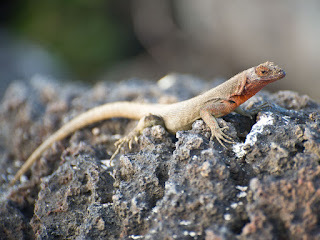 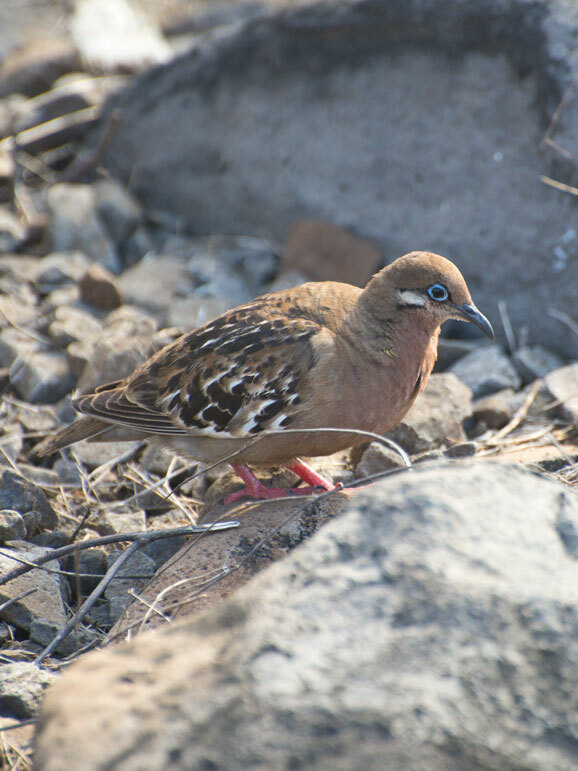 We walked along a rock path, seeing more Lava lizards, a dead sea lion, some dessicated bodies of unfortunate iguanas, as well as the endemic Galapagos Dove (which was very much alive). All the while Frigatebirds and Tropicbirds sailed through the air in the distance. 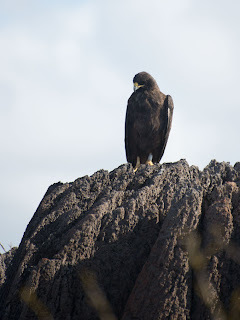 We were in search of the Galapagos Hawk and soon we found two individuals. 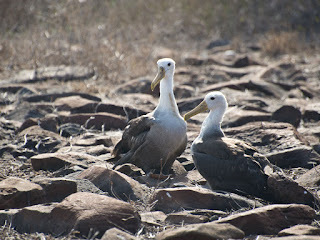 Then it was on to the first of two "runways' for Waved Albatrosses. 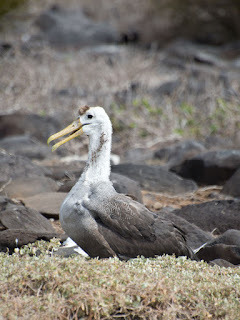 Waved Albatrosses are spectacular fliers with wingspans of over 7.5 feet. 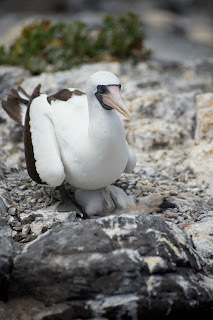 Because of the way they are built landing and take off aren't as spectacular as their flight abilities. 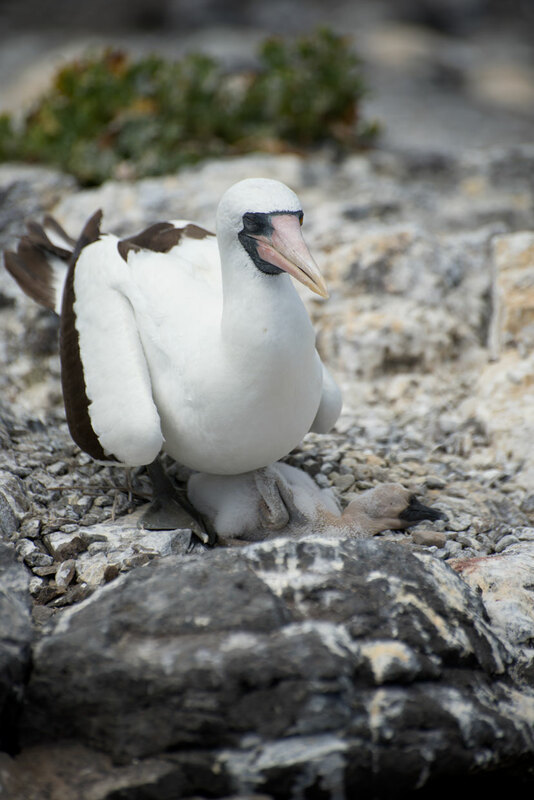 When they can, they use high cliffs to launch themselves into the air. Tiny Small Ground Finches poked about in the dry grasses between rocks on the Albatross' runways. Can you spot marine iguanas in the tide pool? Blow hole. 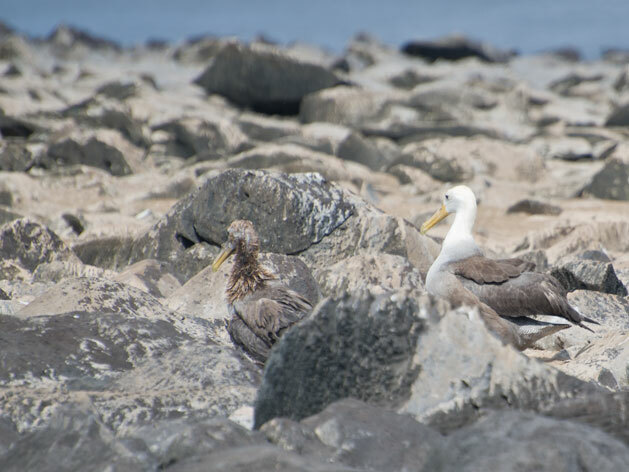 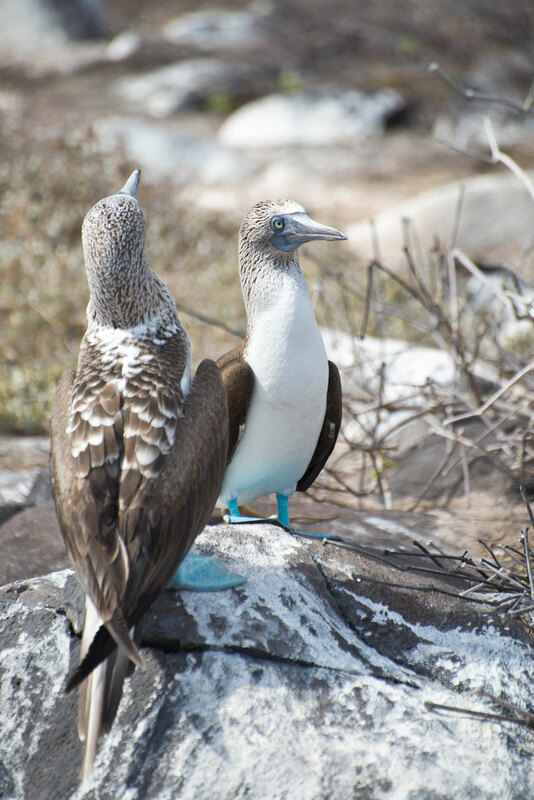 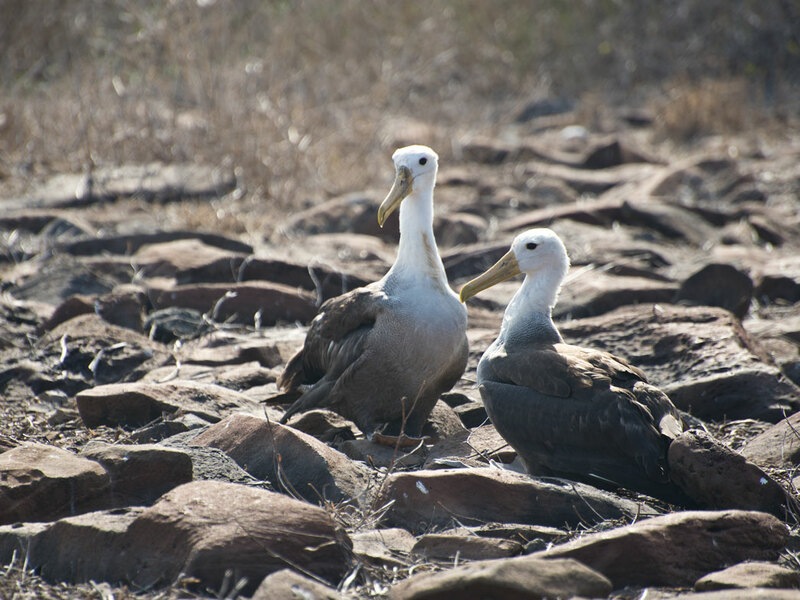 Nazca Booby on left. We sat on the cliffs enjoying the show the flying sea birds and hawks put on. I sat, sharing the rocks I was perched on with a Lava Lizard and a Marine iguana. 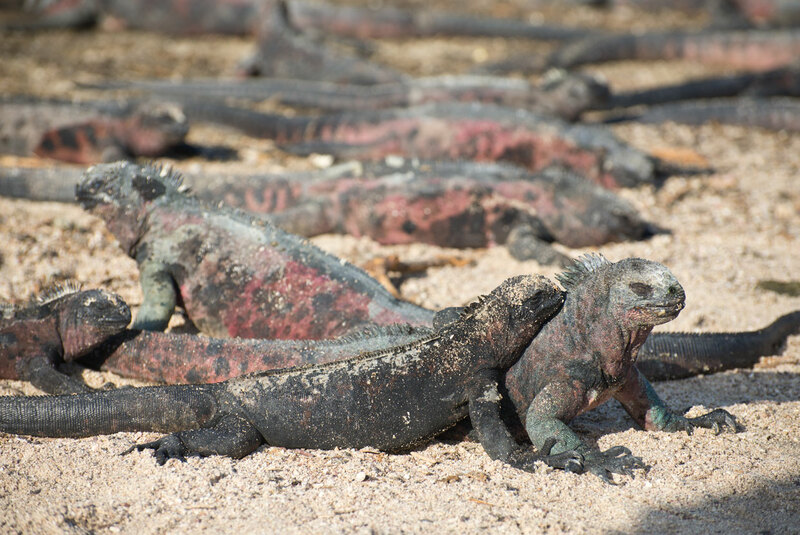 Far below, iguanas slid through the water and waves amidst diving boobies. 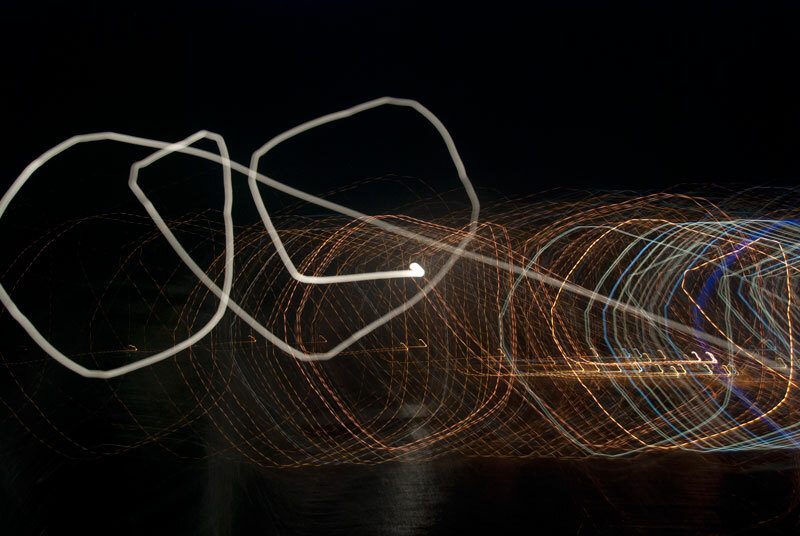 This was a completely fortuitous find. Traveler Thirteen and I just happened to sit next to these two lizards. Male Lava Lizard in foreground and male marine iguana in background. 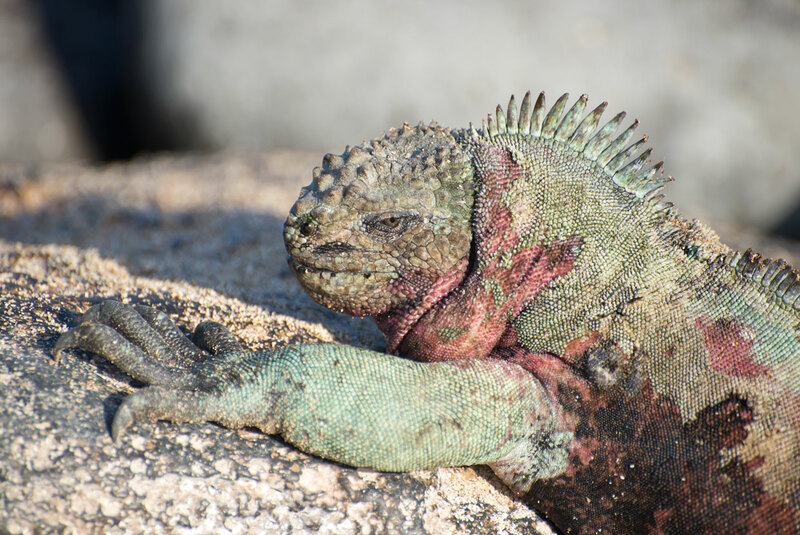 The same male iguana as above. 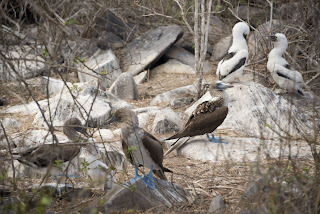 Our walk continued into an area where Blue-footed boobies and Nazca Boobies nested. 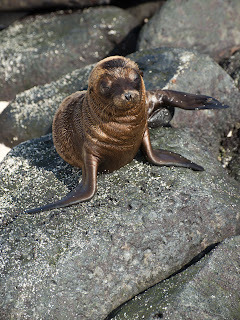 And, though late in the season there were still juveniles, some quite young. Nesting Blue-footed Boobies with young. 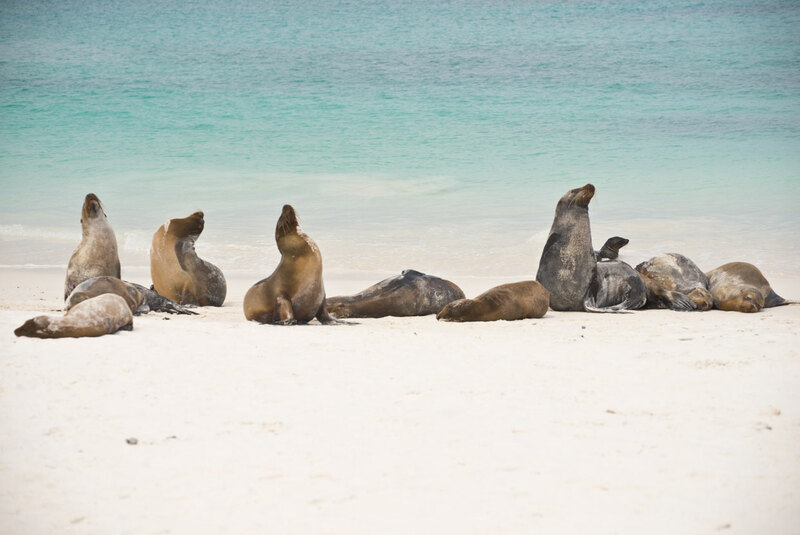 Early afternoon brought us to Gardner Bay. 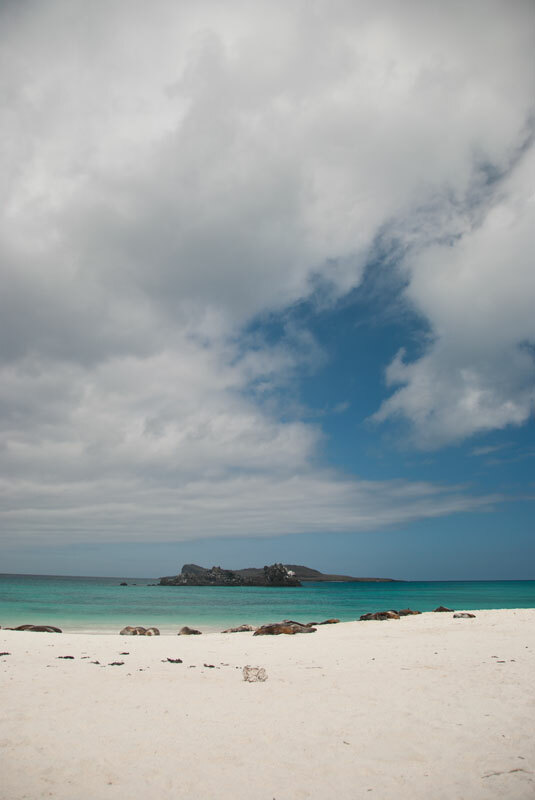 The water could not be any more clear, the sand any more white. 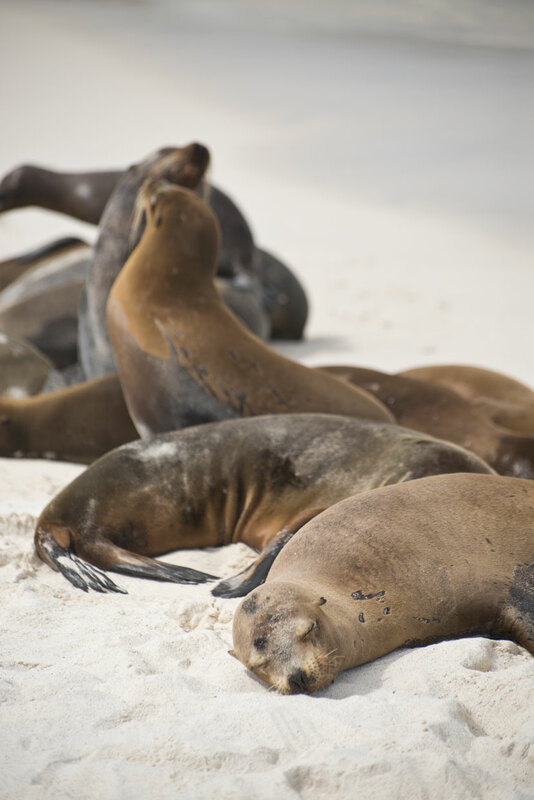 Sea lions line the beach. 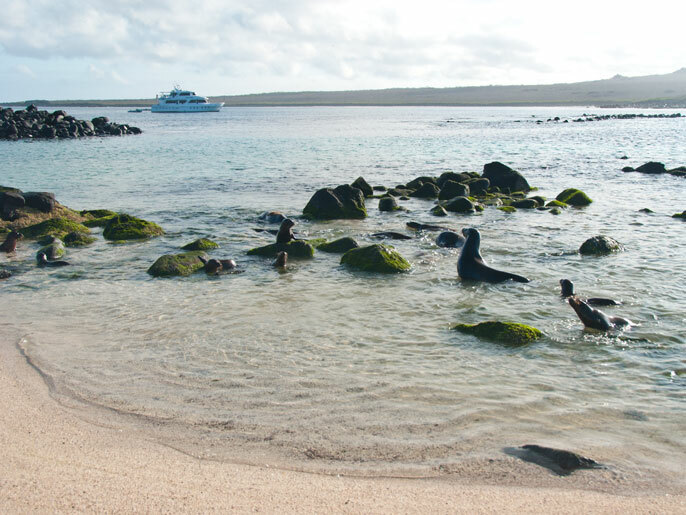 The pups playing in the waves and with humans swimming and snorkeling. 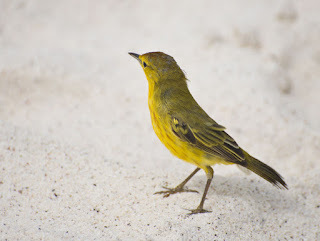 Española Mockingbirds and Yellow Warblers hunted water bottles and insects respectively along the white sands. 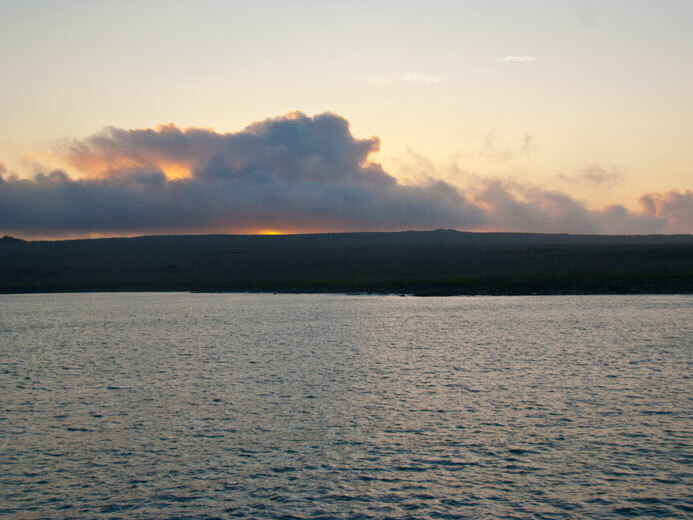 This for me in some ways is the most iconic photo that captures the spirit of this bay. Peace. Traveler Nine swam and enjoyed the sun while Travelers Ten, Thirteen and I headed out in full snorkel gear to explore the rock formation off the coast. Then it was time to just enjoy laying in the sun watching the true masters of the beach, the sea lions, be their beautiful and amazing (and amazingly argumentative) selves. Sometimes the best way to deal with an annoying neighbor is to bite them. 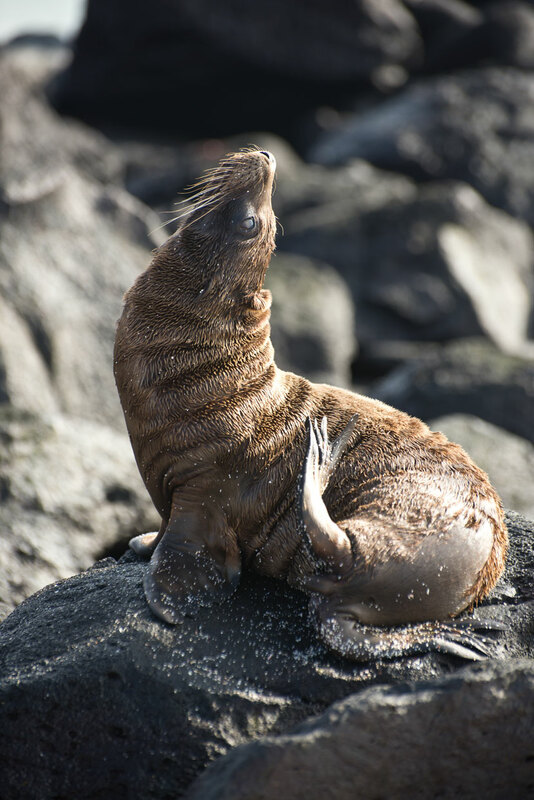 The ultimate sea lion pose. 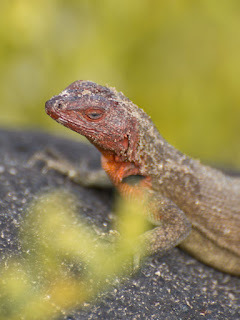 Its all about attitude. That afternoon we began our long journey to our last stop: San Cristobal Island. 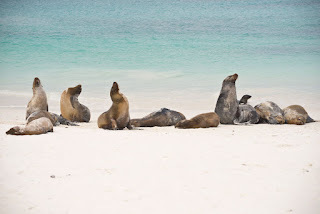 My fellow Travelers and I, along with the other passengers enjoyed our afternoon of leisure. I tried to take a nap but we were rolling from side to side so much in the swells of the open ocean that I was having a hard time not rolling out of my bunk. I tried to take a shower, which took some creative positioning in order not to slide right out of it and land in the toilet. 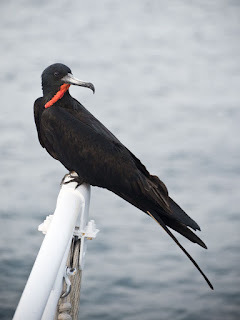 Magnificent Frigatebird, male, catching a ride on the Aida Maria. 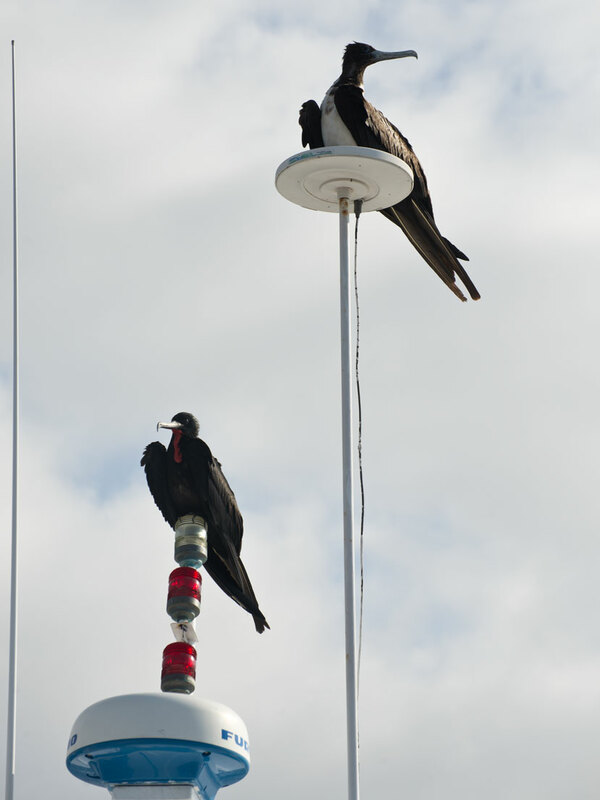 Magnificent Frigatebirds (male: bottom, female: top) catching a ride on the Aida Maria. 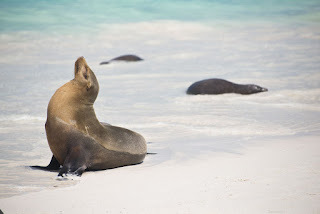 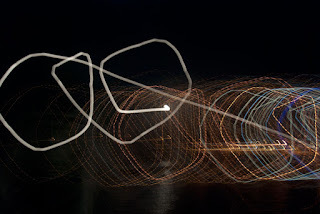 That evening we investigated the capital of the archipeligo, the town of Puerto Baquerizo Moreno, where the sea lions rule the waterfront, taking over the piers and the public benches. 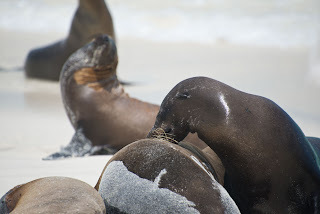 Again, this is a sea lion's world my fellow humans and the male sea lions aren't shy about reminding us of this. 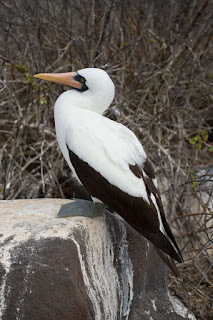 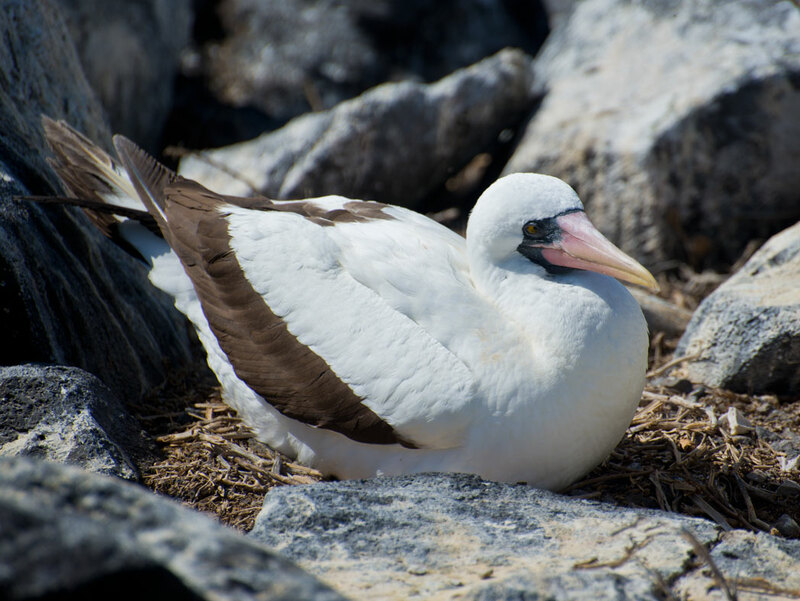 Birds sighted: Magnificent Frigatebirds, Red-billed Tropicbirds, Española Mockingbird, Galapagos Dove, Yellow-crowned Night Heron, Band-rumped Storm Petrel, Galapagos Hawk, Blue-footed Booby, Nasca Booby, Small Ground Finch, Waved Albatross, Brown Pelican, Swallow-tailed Gulls. 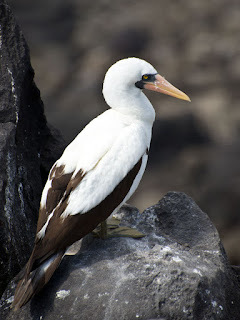 A very wonderful Wildlife. I just curious about the wonderful animals in heaven someday.